If you’ve been following our coverage for the past few weeks, you know how awed we were by AMD’s new 32-core Threadripper 2990WX. Still, there’s much potential to be unlocked by the modding community, despite its top-notch performance. 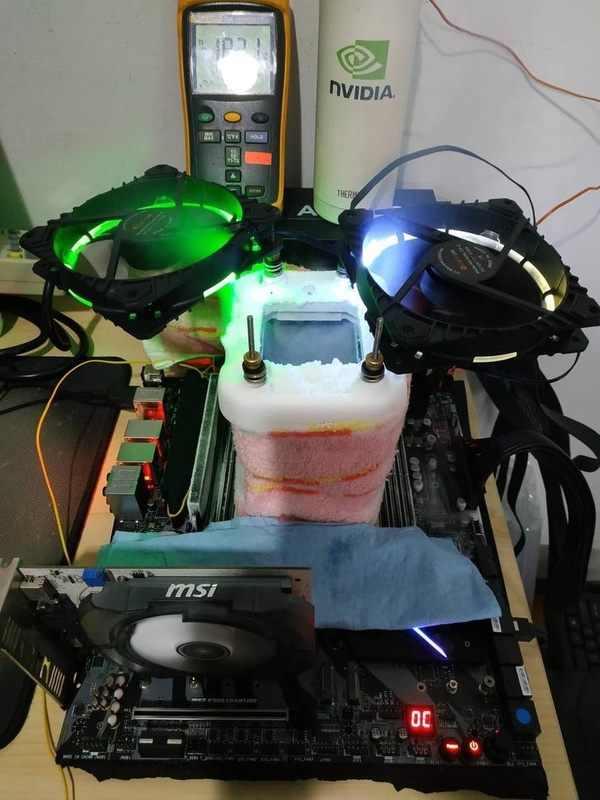 As of latest, the processor has been overclocked to nearly 6GHz (5955.4MHz to be precise) by the Indonesian overclocked Ivan Cupa. The Threadripper 2990W had already been boosted to 5.1GHz, previously. Remember that in its base configuration, the processor runs at 3.0GHz, with turbo clock pushing it to 4.2GHz. Don’t expect yourself to be able to achieve this in your living room, however. Cupa used a Corsair 1500W power supply, an MSI MEG X399 Creation motherboard as well as liquid nitrogen to keep the temperature at an icy cool -184 degrees Celsius. Only one core was overclocked. Other specs were relatively modest, including a GT 730 graphics card, a 240 GB HyperX SSD and a single 8 GB DDR4 memory stick. However, the supply of liquid nitrogen could prove elusive. Another enthusiast, Alva Jonathan, has boosted all the 32-cores up to 5.4GHz, also an impressive feat. On a similar frequency, an overclocker called Sampson tested the processor at Cinebench R15 benchmark to achieve a score of 8532 points. AMD’s much more modest Ryzen 7 CPU has previously also been overclocked to 6GHz, which is great news for gamers, as that processor is considerably more mainstream. While that was also achieved with liquid nitrogen, basic modding should be easy, especially with AMD bundling Wraith coolers with some of its CPUs. Here, how the Setup looks like, in case if anyone curious about it. Amd will launch its 7nm chips next March/April while Intel is having trouble releasing its 10nm next year, which they were supposed to release this year (lower nm is better). Intel chips are also vulnerable to security flaws (meltdown and now foreshadow). With AMD set to dominate the performance and not be vulnerable to security flaws, they will have the best performance/power/$money chips for atleast the next 2-3 years. And yet AMD is not officially available in Pakistan.